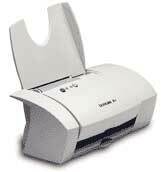 The combination of the Umax 1220P and the Lexmark Z11 is a well balanced combination for both printing and scanning. When combined with a computer, they make a low priced copier as well. The Umax 1220P comes complete with software, a cable to connect the scanner to the computer and a power brick for under $100, depending on rebates. You will need to buy a bi-directional printer cable to connect the scanner to the printer. Both devices share the same parallel port. I installed the scanner first by loading the Adobe PhotoDeluxe program then the VistaScan TWAIN scanner driver. It is critical that you install the software in this sequence. You can then install the other included software - Presto Page Manager, Presto Photo Album and OmniPage LE. After this is complete, you are ready to scan! To copy a document, place it on the scanner top, then start the Page Manager application. In a few minutes, you will have a scanned document that you can electronically file, fax, E-mail or print. The copies are as good as copies available from a copy center at a fraction of the cost. The best reason for buying a Lexmark Z11 is the price. It usually costs about $50 after the mail in rebates and its black ink cartridge is good for making hundreds of pages of copies or printouts. In addition, this remarkable low cost machine can also print in color as well, with only a quick cartridge change. Setup and installation is also quite simple. The included software allows you to watch the progress of printing documents and keep track of the ink supply. The Z11 features a 1,200 x 1,200 dpi printing resolution, which is incredible at this price! It prints at up to 4 ppm in black & white and about two and a half ppm in color. The speed varies, depending on the size of the colored area on the page. The printer weighs about four pounds, so it can be easily carried between computers in a home environment. Watch for my follow-up article on the Z11's big brother, the Z51 and Rick Smith's article about Lexmark's newest printer, the Z52. Both of these printers have a black & white and a color cartridge loaded at the same time and these can both use the optional photo ink cartridge for six color printing. With the Adobe PhotoDeluxe software included with the Umax 1220P scanner, you can use your scanned-in picture on the Internet, or include them with documents you print on the Lexmark Z11 printer. I recommend this combination - they're great together. For a printer/scanner combo in one unit, see my review of the Xerox XK35C.